NASA's balloon-carried BLAST sub-millimeter telescope is hoisted into launch position on Dec. 25, 2012, at McMurdo Station in Antarctica on a mission to peer into the cosmos. A giant helium balloon is slowly drifting above Antarctica, about 22 miles (36 kilometers) up. Launched on Tuesday (Dec. 25) from the National Science Foundation's Long Duration Balloon (LDB) facility on Earth's southernmost continent, it carries a sensitive telescope that measures submillimeter light waves from stellar nurseries in our Milky Way. "Christmas launch!" wrote officials with NASA's Wallops Flight Facility, which oversees the agency's balloon research program, in a Twitter post yesterday. "BLAST launched today from McMurdo Station, Antarctica." This is the fifth and final mission for BLAST, short for the Balloon-borne Large-Aperture Submillimeter Telescope, and mission designers hope it will reveal why so few stars are born in our galaxy. On Dec. 12, BLAST was still in one of the two giant Payload Assembly Buildings at the LDB facility, a short distance from the U.S. research center McMurdo Station. Principal investigator Mark Devlin of the University of Pennsylvania and a group of graduate students were mounting a giant sunshade on the telescope, to ensure that the ultra-cold detectors won't heat up during the flight. "The detectors are cooled to 0.3 degrees aboven absolute zero, using liquid helium," said Devlin. "If they were any warmer, they wouldn't be able to register the faint submillimeter radiation of cold interstellar dust clouds at just 30 degrees above absolute zero." After test flights in 2003 in New Mexico and in 2005 in Sweden, BLAST's third flight, in 2006 from Antarctica, was a "mind-boggling" success, Devlin said. The instrument revealed beyond doubt that in most distant galaxies, new stars are born at a prolific rate. By measuring the star formation rate in galaxies more than 7 billion light-years away, the researchers determined that over half of the stars in the uuniverse were born within the first 5 billion years after the Big Bang. "But there's an unsolved problem," added co-principal investifator Barth Netterfield of the University of Toronto, Canada, who was assisting the BLAST team with the launch preparations. "BLAST found lots of so-called dark cores in our own Milky Way — dense clouds of cold dust that are supposed to be stars-in-the-making. Based on the number of dark cores, you would expect our galaxy to spawn dozens of new stars each year on average. Yet, the galactic star formation rate is only some four solar masses per year." The idea is straightforward: magnetic fields tend to align electrically charged, elongated dust particles. If dust particles have a preferred orientation, they will slightly polarize the submillimeter radiation from the cloud. Using polarimeters, BLAST can detect if the radiation is indeed polarized, and if it is, determine the direction of the magnetic field. "If there's no polarization present," said Netterfield, "turbulence must be the reason" why so few dark cores collapse into new stars. In 2010, on its fourth mission, BLAST was already equipped with polarimeters. However, accdording to Devlin, "that flight did not do so well because of a melted filter. We have some data, but we know we can do better." Luckily, repeating a balloon-borne experiment is much easier and much cheaper than re-launching a scientific satellite. After each flight, most of the payload is recovered and can be used again. In particular, the BLAST camera with its sensitive and expensive detectors has been recovered every single time. 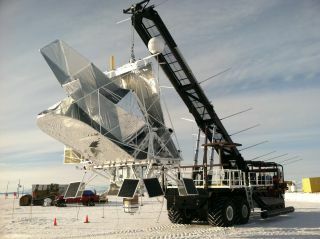 The BLAST balloon-borne telescope experiment prepares for its fourth liftoff on Dec. 27, 2010. BLAST's fifth flight will probably last between 12 and 14 days. While Devlin, Netterfield and their colleagues are celebrating Christmans and New Year's Eve, the 4,000-pound (1800 kilograms) stratospheric telescope will observe selected star-forming regions in the constellations Vela and Lupus. And if senior graduate student Tristan Matthews of Northwestern University Illinois has his way, this may not be BLAST's final mission after all. Depending on the results and the recovery success of the current flight, Matthews hopes to fly BLAST in its present configuration for a sixth time, in the Arctic. "That would give us access to a well-studied and nearby star-forming region in Taurus," he said. Meanwhile, Devlin has received a $5 million grant from NASA over a period of five years to develop a larger version of BLAST, with a 2.5-meter mirror, as compared to the current 1.8-meter aperture. That would vastly increase the number of stellar nurseries that could be studied. "We could fly SuperBLAST in 2016 or so," he said. Dutch astronomy writer Govert Schilling visited McMurdo Station and the Amundsen-Scott South Pole Station as a selected member of the U.S. National Science Foundation's 2012/2013 media visit program. Follow SPACE.com on Twitter @Spacedotcom. We're also on Facebook and Google+.